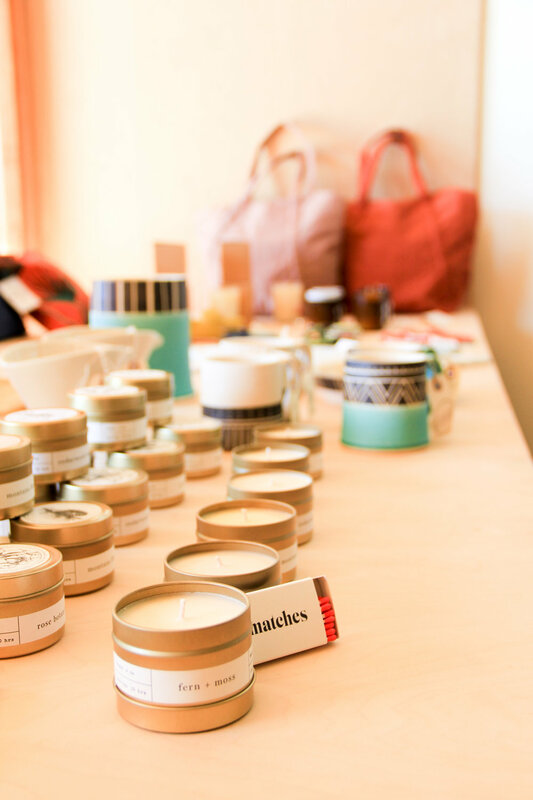 Ever since moving back to Phoenix from San Francisco last October, a boutique that opened up at the same time quickly became our favorite local place to pick up gifts. 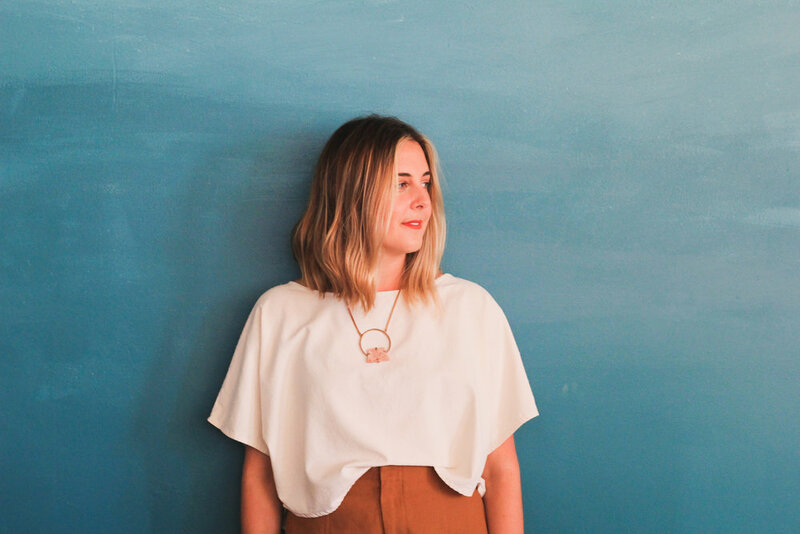 That store is Local Nomad, and we had the pleasure of catching up with owner, Lauren Danuser, to chat inspiration, location, and favorite post work hangouts at her beautifully curated shop. Having also moved from San Francisco, we can totally see how San Francisco style has influenced your choices. What brought you back to the Valley? I love how you can feel the San Francisco influence in the shop! SF was my home for 8 wonderful years and I really found my authentic style during my time there. I met my husband in San Francisco and he is from Central Phoenix, so we ended up moving here when he switched careers to work in the family business. How did you decide on the name Local Nomad? I thought about the name for so long and it came to me one day in the shower, of course! I was conjuring up the brand concept and had just returned home from a 2.5 month backpacking adventure in Europe (my husband and I took a long honeymoon!) where I was so inspired by boutiques all over Paris, Copenhagen, Amsterdam and Berlin. Travel is a big part of my life and when we were on our trip I came across so many amazing brands in each shop I visited and realized I wanted to bring handcrafted goods from all around the world into my own little shop. Local Nomad is an oxymoron but it makes sense in that we carry handmade goods that are locally made somewhere around the world. My goal is to have customers feel a sense of discovery when they walk through the door and connect with a product based on where it's from. Where do you go for inspiration on what to stock? I get inspiration from all over. As I mentioned, I'm an avid traveler so whenever I visit a new city I make a point to find local boutiques to support them and also check out what local brands they're carrying. Trade shows are great and I go to a couple each year but I really love going to farmers markets, flea markets, really anywhere handmade goods are being sold to feel inspired. Instagram is also an amazing resource - I can get into a pretty deep black hole but find some amazing brands along the way! Local Nomad is for people who...are interested in the slow fashion movement and want to make more conscious purchases. 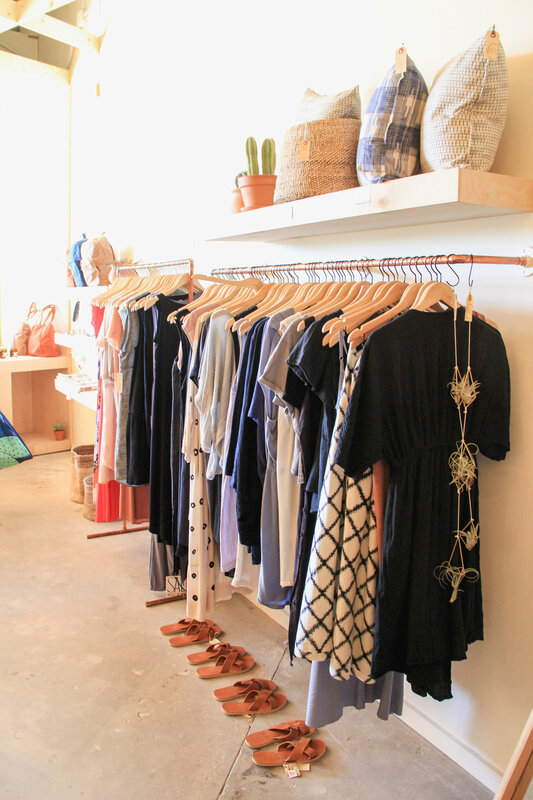 How did you become a boutique owner? My career has been down a pretty straight and narrow path. I majored in fashion merchandising in college, worked as a buyer for Gap and Old Navy in San Francisco, and then managed a boutique in the city for 2 years to validate my desire to open my own shop. Starting a business is a huge risk and I'm not a natural risk taker, so through my experience I felt really prepared to pursue my dream once the timing was right. Where do you travel for inspiration? I love traveling anywhere and everywhere! I especially enjoy walking around big cities and love visiting New York, LA, Portland and Seattle. There's something so romantic about strolling through New York any time of the year. It's definitely my happy place. When I was in Copenhagen I fell in love with Scandinavian design, which inspired part of the design concept for the shop. Mexico City is the next international destination on my list - I've heard nothing but amazing reviews about the vibrant culture and art scene. What drew you to your location at Camelback and Central? I honestly didn't know too much about Central Phoenix before moving here. I had visited plenty of times to see my husband's family but I never gained a true sense of the city. After talking to family and doing a bit of research, I realized Central Phoenix was where my target customers lived and I knew I needed foot traffic from other larger business to draw people into my shop. I had always dreamed of opening a shop on a charming city street but Phoenix doesn't exactly have walkable shopping areas so I tried to find the next best thing. We are located in a newly renovated shopping center alongside other local businesses and national anchors. The vibe of the plaza suits our shop really well and I feel like we're in great company with our neighboring local shops and restaurants. Where is your favorite place to grab a drink after work? We're lucky to have Huss brewery as our neighbor in Uptown Plaza so I love hopping over there after work to grab a beer. For cocktails Lux Central is my go-to. Lux is our neighborhood coffee shop + bar and they serve delicious craft cocktails in a really relaxed space. What are your go to restaurants? My favorite place to go on a Friday night after work is Restaurant Progress. It's cozy and quaint with beautiful slow food and amazing cocktails. Barrio Café for Mexican and Ocotillo for dinner al fresco. Who has inspired you to get where you are today? My husband has been the biggest source of inspiration on this journey. He's a small business owner himself and I'm constantly in awe of how many things he manages to juggle each day. He pushed me to pursue my dream and believed in me through the entire process, assuring me that even the thought of failure was not an option. 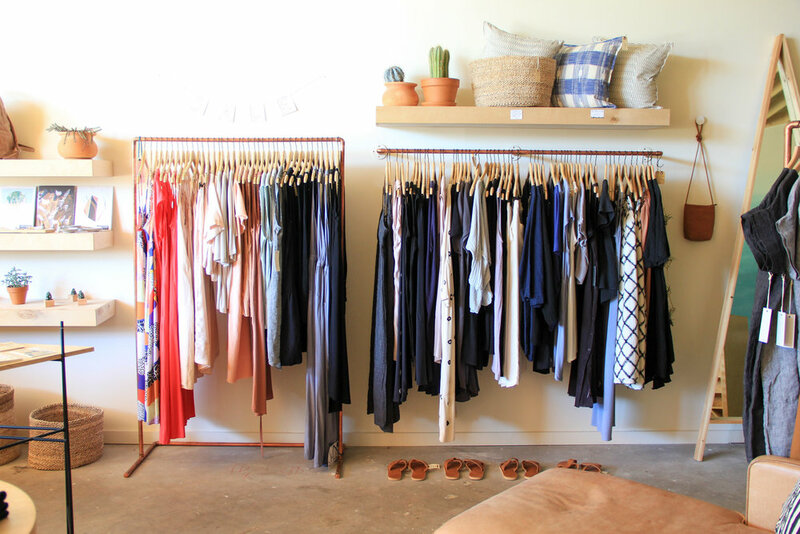 What's the biggest challenge of owning a small boutique? I think the biggest challenge is wearing so many hats. The business never turns off so in a way I'm always working. When I'm in the shop my #1 focus is connecting with customers so everything else I have to do becomes a secondary priority. Checking in shipments, doing inventory, updating our website, answering emails, paying bills, curating our instagram, merchandising the store, vacuuming the floors - there are a million things I do each day but having a variety of responsibilities is what keeps my job exciting and interesting! Thank you! We promise you we won't clog your inbox. Sites we love and frequent, because B.O. isn't quite a one stop shop yet, and our goal is to inspire you.